Sell your bitcoins on the exchange for cash into your back account. BitQuick.co, or BitQuick, is exactly what it says it is in the name. It’s a marketplace for instantly buying and selling bitcoin quickly. It brands itself as “the premier service to buy bitcoin in just 3 hours.” The company was founded in 2013. Headquartered in Ohio, BitQuick.co, formerly BuyBitcoin.us, came into existence in part because one of the founders had been scammed and hacked. He wanted to reduce the dangers of dealing with bitcoin while also easing the process. Select an order on the buy page or use the quick buy app. Enter your email address and click submit. Deposit the described sum of cash to the account shown on the confirmation page. Go to any local branch of the sellers bank and fill out a deposit slip. Upload the receipt to the page provided in your confirmation email. Coins are typically sent within 3 hours of the funds being confirmed by the seller. Many people have asked, is BitQuick legit? That’s exactly the question this BitQuick review will be looking to answer. 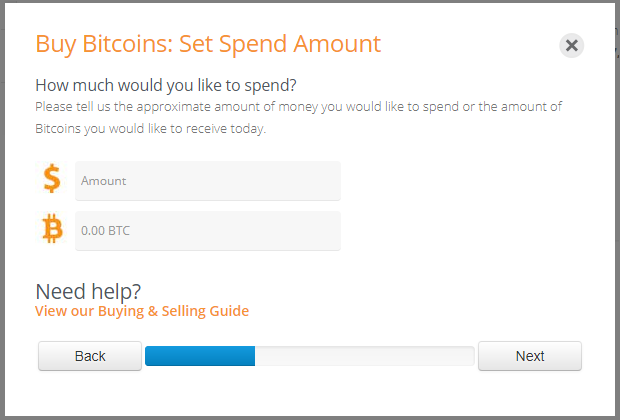 Buying Bitcoin with BitQuick—How Does It Work? 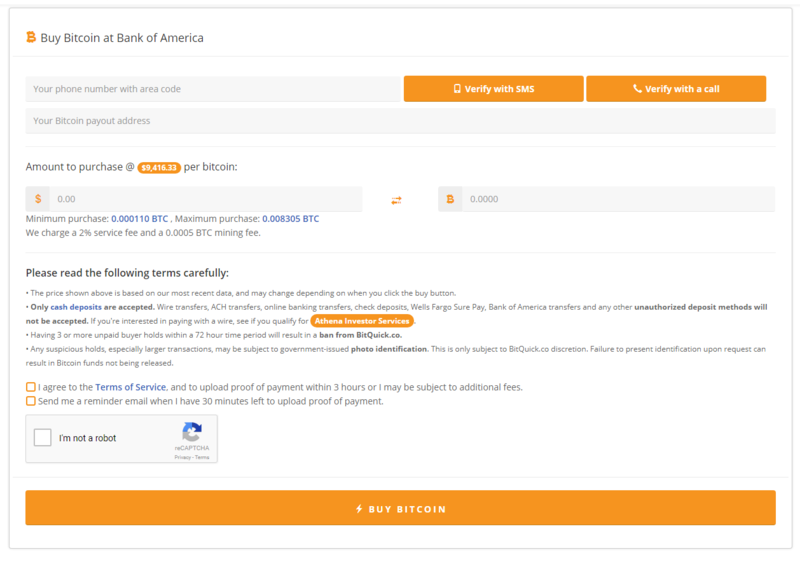 There’s no signup to buy bitcoin from BitQuick.co. You will be required to verify your phone number, and on some orders, you may be required to provide proof of identity by uploading a picture of your driver’s license or personal ID. In this way, BitQuick.co follows the AML (Anti-Money Laundering) and KYC (Know Your Customer) policies by closely monitoring any transaction with an amount that triggers suspicion. This is left to the discretion of BitQuick.co. 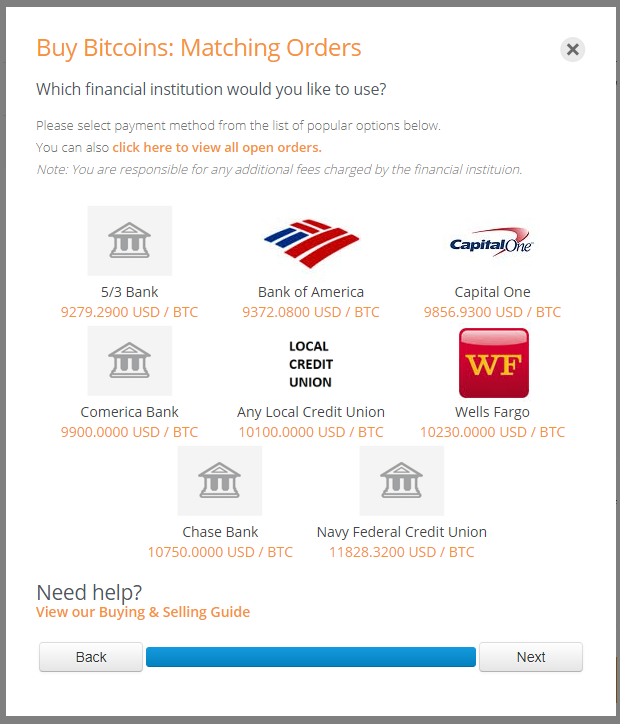 You can buy bitcoins several ways at Bitquick on your computer or using your mobile device. To start, you’ll click on the buy tab at the top of the page. If you want an easy to follow guide to buy bitcoins use the BitQuick Quick Buy app. Scroll down the page and you’ll see a list of orders with varying banks and credit unions. These orders can also have minimum and maximum purchase amounts. Find the one that suits you and click the ID number on the far left of the chart. Whether you use the Quick Buy app or the Open Orders list, you will eventually land on this order verification page. Add your phone number and verify with SMS text message or with a phone call. Add your bitcoin payout address. Add the amount you want to purchase. Agree to terms of service . You can have them send you an email reminder. You must verify you’re not a robot. Click the ‘BUY BITCOIN’ button. Once you provide the information, and click the ‘BUY BITCOIN’ button, you’ll receive your public and private key. Your public key is your wallet address; your private key is the password. After you complete the order, you’ll receive an email with necessary account information. The email offers the opportunity to cancel the transaction. If you proceed, you’ll go to the bank or credit union that corresponds with your order. You will deposit or transfer money to the seller’s account, and it must be in cash. You’ll be given a receipt for your deposit or transfer. Write, “For BitQuick.co,” at the top of the receipt. Just below that, write, “No refunds.” Take a picture of the receipt and upload it as proof. After it uploads, your bitcoin will be transferred to your wallet within three hours. Deposit options and limits vary from order to order. 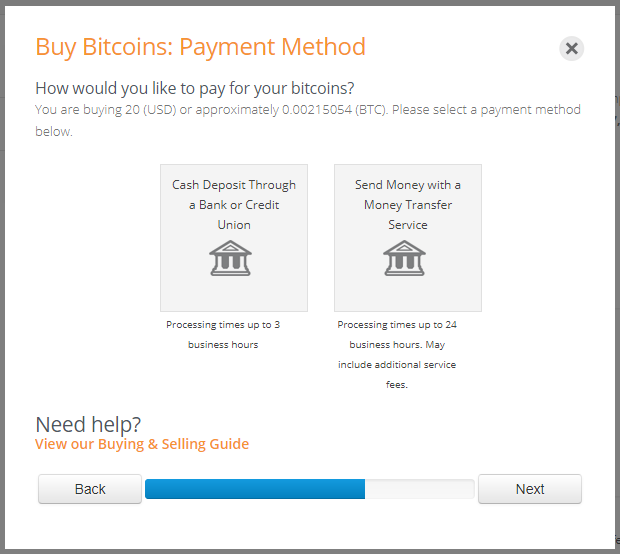 BitQuick.co charges a flat two percent fee to buy bitcoin, but there’s no fee to sell bitcoin. 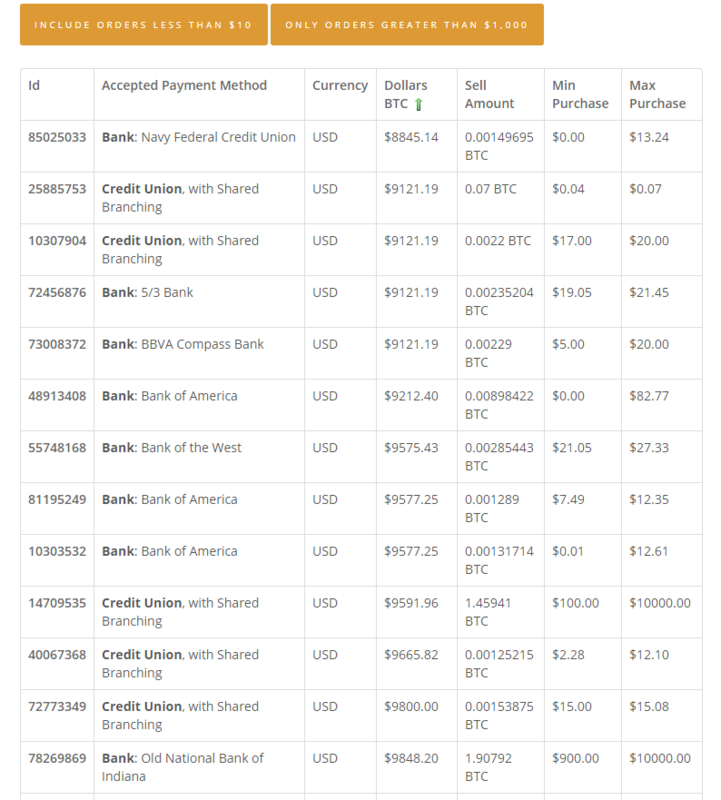 To extract their fee, BitQuick.co subtracts the percentage from the bitcoin amount before they send it to the buyer. On any part of the site, you have the option to reach out to support by clicking the Contact Us tab at the top of the page. BitQuick.co has also provided an FAQ and instructional videos under the How To tab. Should you run into any issues getting the seller’s account number or being unsure you’ll be able to upload the picture of your receipt before the hold time expires, BitQuick.co urges you to reach out to their support team. On the whole, they seem to run a helpful site dedicated to a positive customer experience. The primary pro of using BitQuick.co is how simplified the process is. Buying bitcoin is a three-step process of choosing an order, paying money and uploading proof of payment. In addition to this, once you choose an order, the bitcoin amount is placed in escrow to assure you get what you pay for, so long as you pay in time. The biggest con of using BitQuick.co is the inability to use other form of payment besides cash. Other bitcoin marketplaces, such as Coinmama, allow the use of credit card, which can make this issue particularly frustrating. The upswing though, while inconvenient, provides an extra layer of security to all transactions. There are a number of bitcoin marketplaces to choose from, but BitQuick.co is a particularly trusted and secure option, and the ease of use certainly makes it worth your time. Verify your buy orders using your phone number. * I.D. is not required unless they suspect illegal activity or for larger transactions. Since bitcoins are sent directly to your private wallet after you buy them, there isn’t a withdrawal method needed. If you’re selling bitcoins, you don’t need a withdrawal method either, as the cash is deposited directly into your bank account. That concludes this BitQuick.co review.